Guinea Fowls Rest B&B - Harare Accommodation. 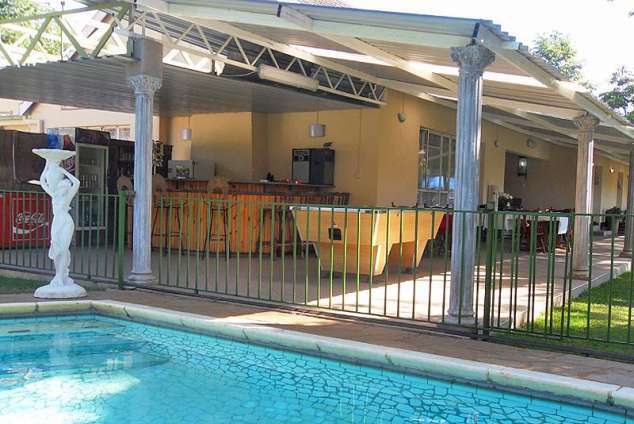 Comfortable , homely, secure & relaxing overnight accommodation in up-market suburb of Harare. Ideal for visitors to Harare, whether on holiday or for business. Close to city centre, hospitals and shopping centres and restaurants. Bridge Spar only 500m; Airport 20mins drive; 10mins from city centre. 3) Twin beds, en-suite bathroom and 4 DSTV channels. 4) Large family room - double bed and a set of bunk beds with en-suite bathroom and kitchenette. Comfortable lounge has full DSTV. A sparkling swimming pool for those beautiful warm, sunny days! Good security - 24 hour guard with radio plus Multilink Rapid Response and CCTV. Completely dura-walled & electric gate. Each bedroom has their own control for the gate. In the event of a power cut, a large generator is on stand-by which will run the geysers, plug points, lights and borehole for continuous water. Breakfast is included in the daily rate and other meals, including packed breakfast / lunch, can be provided on request. ADSL Internet connection are available and laundry can also be done. 7038 page views since 19 Dec, 2012. Last updated on 03 Aug, 2018.